Carolina Central Railway began in 1855 as the Wilmington & Charlotte Railroad Company, soon changing its name to the Wilmington, Charlotte, and Rutherford Railroad (WC&R) to reflect its intended course. Construction of the road began on 1 Jan. 1857 at Navassa, on the west bank of the Cape Fear River near Wilmington. By April 1861 the company had completed 112 miles of track from Navassa west to Rockingham and another 31 miles from Charlotte west to Lincolnton. The Civil War interrupted construction, which was not resumed until 1870. By 1873 the WC&R had failed financially and was sold at foreclosure to new owners organized as the Carolina Central Railway Company. By the close of 1874 they were able to complete the line between Rockingham and Charlotte and also extend it west from Lincolnton to Shelby. But the new owners, like their predecessors, were unable to make the road profitable, and in 1876 the firm was once again sold at foreclosure, emerging this time as the Carolina Central Railroad Company (CCRR). The following year, the Seaboard & Roanoke Railroad-which was beginning the expansion that led to the formation of the Seaboard Air Line system-began acquiring control of the CCRR, and the line eventually became part of that larger system. In 1887 the last section of the railroad was completed from Shelby to Rutherfordton, establishing a 267-mile link from coastland to foothills across southern North Carolina. By 1890 the line had been relaid with steel rails, and by 1900 the CCRR had lost its separate identity. Despite its stormy history, the line has fared well in modern times compared to other Wilmington lines. Most through traffic between the north and east on the former Atlantic Coast Line and former Seaboard lines to the west and southwest has been diverted to the former CCRR's line to and from Hamlet. The entire route has remained in service, with the main portion operated by CSX Corporation, successor to the Seaboard Air Line and other companies that had merged. West of Bostic in Rutherford County, the old CCRR is operated by the Thermal Belt Railway, an independent short line. A distinguishing feature of the CSX portion is a 79-mile straight track from a point near East Arcadia west of Wilmington to a point near Laurel Hill in Scotland County. It is the longest stretch of main-line railroad without a curve in the United States. S. D. Carriker, Railroading in the Carolina Sandhills (1985). Edward A. Lewis, American Shortline Railway Guide (1996). "An Act To Incorporate the Carolina Central Railway Company." Public laws and resolutions, together with the private laws, of the State of North Carolina, passed by the General Assembly at its Session 1872-73. Raleigh, N.C. Stone & Uzzell. 1873. http://digital.ncdcr.gov/u?/p249901coll22,181900 (accessed August 15, 2012). "An Act To Amend the Charter of the Carolina Central Railway Company." Laws and Resolutions of the State of North Carolina, passed by the General Assembly at its Session 1873-1874. Raleigh, N.C. Josiah Turner, Jr. 1874. http://digital.ncdcr.gov/u?/p249901coll22,194440 (accessed August 15, 2012). "An Act To Perfect the Organization of the Carolina Central Railroad Company." Laws and Resolutions of the State of North Carolina Passed By The General Assembly at Its Session of 1881. Raleigh, N.C.: Ashe and Gatling. 1881. p. 55. http://digital.ncdcr.gov/u?/p249901coll22,197922 (accessed August 15, 2012). 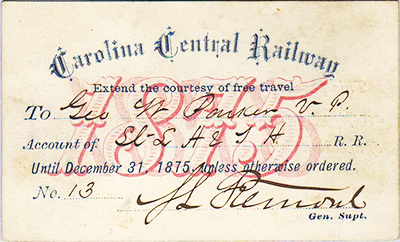 "An act to authorize the Carolina Central Railway Company to exchange stock for bonds." Laws and resolutions of the State of North Carolina, passed by the General Assembly at its session of 1887. Raleigh, N.C.: Josephus Daniels. 1887. http://digital.ncdcr.gov/u?/p249901coll22,202344 (accessed August 15, 2012). Carolina Central Railway Company Records, #4278, Southern Historical Collection, The Wilson Library, University of North Carolina at Chapel Hill. http://www.lib.unc.edu/mss/inv/c/Carolina_Central_Railway_Company.html (accessed August 15, 2012). "Boarding Pass, Accession #: S.HS.2012.1.134." 1875. Image from North Carolina Historic Sites.